The Hypotenuse Leg Theorem states that if the hypotenuse and one leg of a triangle are congruent to the hypotenuse and leg of another triangle, then the two triangles are congruent. In the figure above, and are right triangles with right angles at and and with and . We are going to show that the two triangles are congruent. 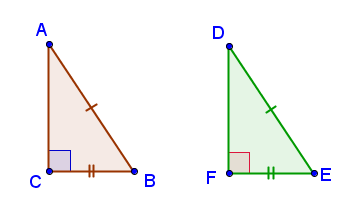 Triangle and , right angled at and respectively, with and . So, by the SSS Congruence, .